Broccoli is not only delicious variety of cabbage, but also useful. Especially for women, as it contains many important for the female body the vitamins and minerals, but also slows the aging process and is considered an excellent anti-cellulite product. 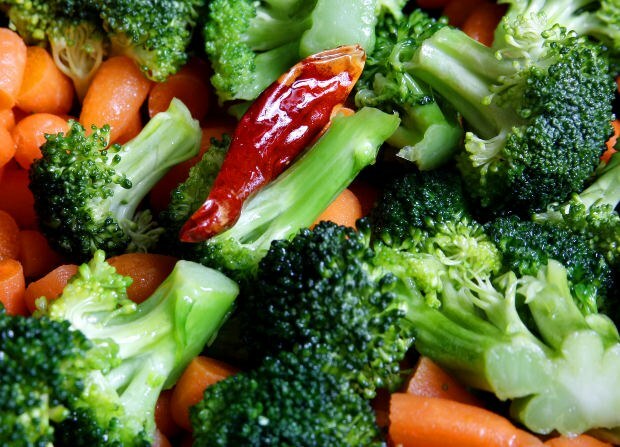 300 grams broccoli, 2 tomatoes, 1 carrot, 1/2 onion, 1 clove of garlic, vegetable oil, salt. 1 bell pepper, 3 tablespoons of sour cream. Wash and divide broccoli into florets. Pour some vegetable oil into the pan and put broccoli. Add salt and fry on all sides. Tomatoes pour over boiling water, remove the skin and cut into cubes. Bulgarian pepper cut into thin half-rings, carrots - rings. Onion and garlic finely chop. To broccoli, add carrots and add some water. The lid on the pan. Onion and garlic sauté separately in vegetable oil. When carrots are soft, add the tomatoes and spasserovannye onion and garlic. Cook for 5 minutes. Put in a pan the cream, stir and simmer on small heat for about 5 minutes. When serving you can decorate with greens. When choosing broccoli, note the young plants with small inflorescences. Fresh cabbage should be stored in the refrigerator for three days. The freezing of the useful properties is lost.